HomeEducationCommonly Asked Questions What Is The Color Of a Padparadscha Sapphire? The actual color of a padparadscha sapphire can be difficult to envision, so we cover all of the bases to eliminate any confusion. The term “padparadscha” can have varying interpretations from different gemologists . There is no formal categorization for padparadscha sapphires, and the determination is often left to the gemologist’s individual opinion. For many, it is perhaps best described as a delicate light to medium toned pink-orange to orange-pink hue. Basically a mix of pink and orange, or salmon colored. The epitome of the stunning color of a padparadscha sapphire. Padparadscha sapphires have been coming exclusively from Sri Lanka (Ceylon) for thousands of years. Only in the last few decades have some other countries slowly produced similar color tones associated with Ceylon padparadschas. Some purists will insist that the sapphire must come from Sri Lanka (Ceylon) in order to be classified as a “true” padparadscha, but the term has been uniformly applied to sapphires of similar color tone , often stretching the boundaries of accepted color. We feel that the finest stones do in fact come from Sri Lanka, and most will agree that this is the best location for a fine padparadscha sapphire. Yet recently, Madagascar has come to find some exceptional material as well. A gorgeous padparadscha sapphire from Madagascar. Madagascar is now producing a major percentage of stones available on the market. They are mostly more pink than orange (usually 20-30% orange and 70-80% pink). These stones are now welcomed as classified “padparadscha” but normally sold at a cost 20% less than “Ceylon padparadschas.” The new sapphires from Madagascar are very beautiful and are a welcome addition to the supply. Tanzania has produced some very interesting color “padparadscha-like” sapphires for many years. Mostly they are a reddish-orange with tones of brown and slight hints of pink. When seen, these stones are very appealing, as the color is very unusual. Although these are also very rare sapphires, they are not usually classified as padparadschas if they have significant tones of red or brown. A reddish-orange or a reddish-brown colored sapphire should not be classified as a padparadscha as a true padparadscha sapphire is classified specifically as a mix of pink and orange and ideally from Sri Lanka (Ceylon). 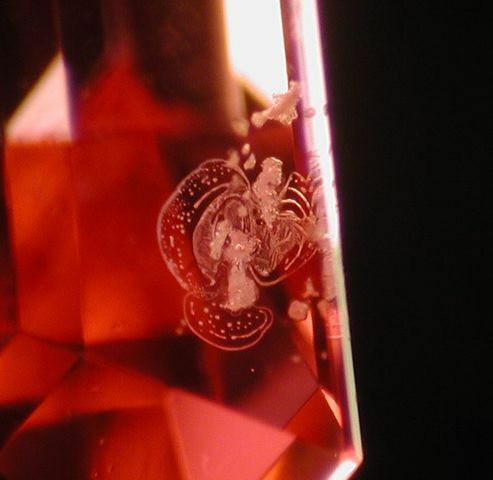 A Beryllium treated padparadscha sapphire showing a melted crystal, a telltale sign of treatment. Most recently, in the late 1990s, beryllium gas has been added to the extreme heating ovens of commercially produced sapphires. Radical color change takes place within pink sapphires when they are heated with beryllium gas. 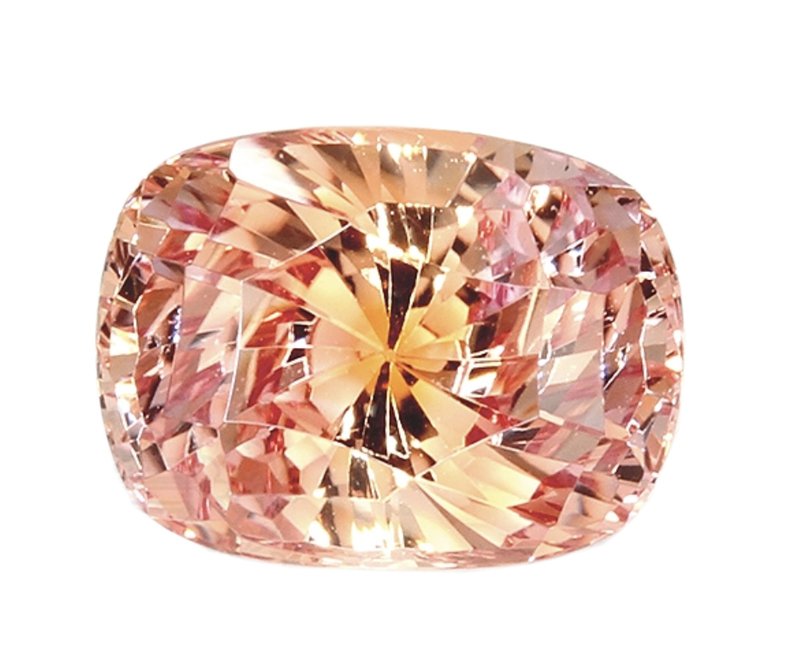 Pink sapphires that would normally sell for a few hundred dollars per carat are turned into pinkish-orange colored “padparadschas” when beryllium gas is used. Magnification of a beryllium treated sapphire. The element beryllium is diffused into the sapphire crystal with extreme heating, resulting in creating an orange coloration. When this orange coloration is added with the naturally occurring pink of the sapphire, a synthetically produced color of pinkish-orange “padparadscha” is created. These created padparadschas are far less valuable than non-diffused padparadschas. 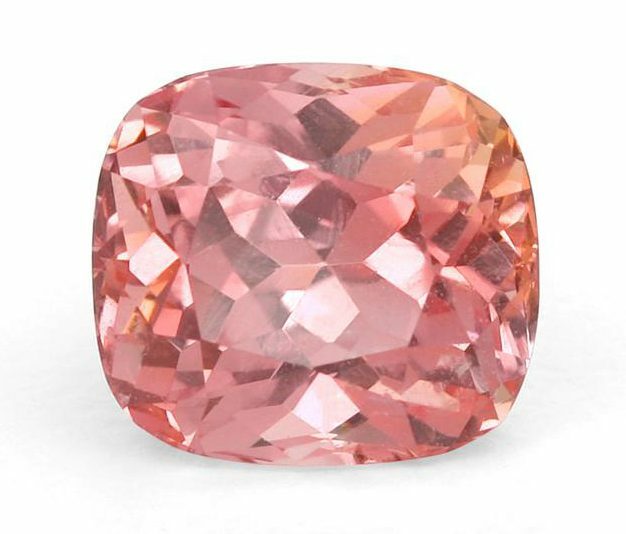 They are not rare and should cost roughly the same price of a low quality pink sapphire that has been heated at extreme temperatures. 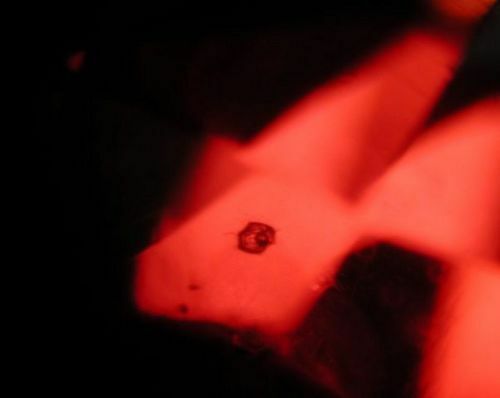 In order for foreign elements to penetrate (diffuse) into the sapphire crystal , extremely high temperatures must be achieved in the heating process. This type of heating requires many days and usually results in the partial melting and reformation of the sapphire itself. One of our beautiful padparadscha and diamond ring creations. 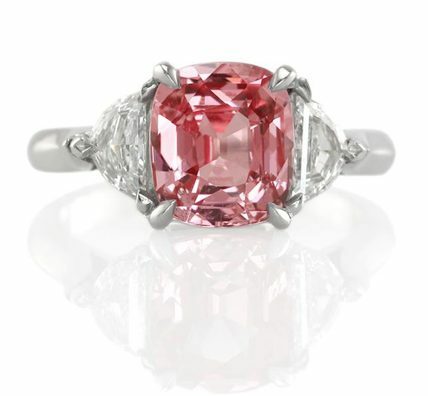 Within our inventory you will see that some of our padparadscha sapphires are certified as heat-treated. This should not be confused with diffusion treated sapphires. “Dry heat” heating is traditional heat treatment among sapphires from Sri Lanka. We talk a great deal about truly rare and valuable unheated sapphires, so one could be quite confused if we are offering or even recommending purchasing jewelry with padparadscha sapphires that are heated. We offer heated (and untreated) Padparadschas because there are basically so few stones available either heated (dry heat) or untreated. The prices for untreated padparadschas are so demanding that almost none but a privileged few have the opportunity to purchase them. Even heated padparadscha sapphires are quite expensive in fine quality. We therefore do make an exception in offering heated (dry heat only – no beryllium diffusion) padparadschas (dry heat means that no fluxes, glasses or additives whatsoever are added in the heating process). We discussed origin with padparadscha sapphires, and we are often asked about the origins of sapphires. We will delve into that topic next with Where Do The Best Sapphires Come From? Commonly Asked Questions Why Do Labs Not Agree On Sapphire Gradings? Commonly Asked Questions Where Do The Best Sapphires Come From?